I received this one as a glue bomb that a buddy picked up for me at a garage sale. 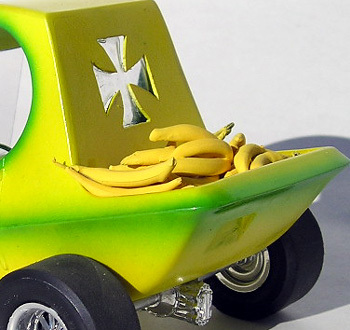 The Pie Wagon always reminded me of a banana so I thought this might be a cool theme. The windshield and front axle were missing so I replaced those with clear plastic and an axle from a parts box. 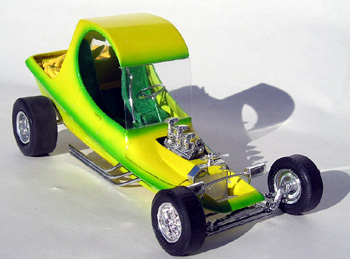 Kustom modifications made include making the pickup bed and back of cab from sheet styrene, lowering the body, chroming the headers and flocking the interior. 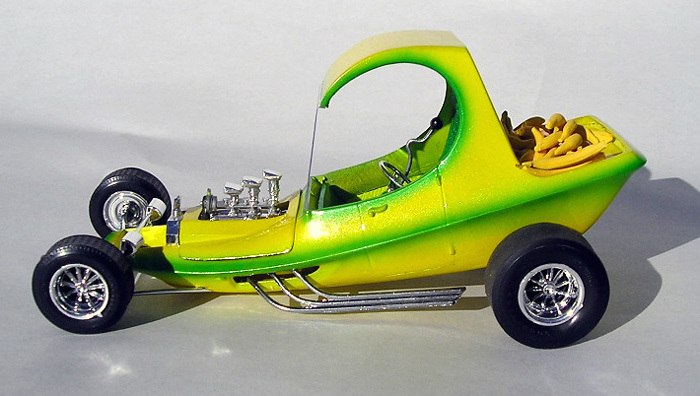 The steering wheel is from the Beatnik Bandit kit. The iron cross window was made by “vacu-forming” a piece of hot plastic with a vacuum cleaner. 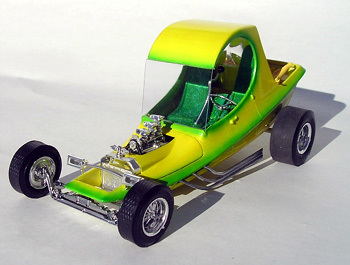 The body seams were filled and it was painted Boyd’s Aluma Coupe Yellow and Bright Green. The interior pan had to be cut into several sections to get it back into the body after paint. The load of bananas was made from melting chunks of sprue. Hope you like it.